Lifesaver is a technique used by the NSA to read (or to image) computer hard drives. I'm not sure how the program got the name* Lifesaver, but there are a couple of interesting things that come up if you google the word. There's actually a data recovery product called EASIS Data Recovery that was formerly called LifeSaver. It's possible that the NSA software was developed from this commercial product. Or more cynically, if you google the words lifesaver, image and hard drive you get testimonials from customers of various commercial data recovery tools speaking about the products as being "lifesavers" for their serious hard drive problems. It's easy for me to imagine a bunch of NSA geeks thinking it would be funny to name their hard drive spy software lifesaver. 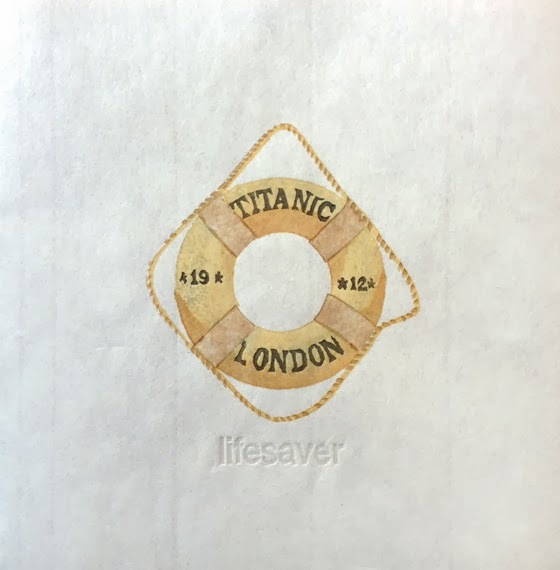 So I thought it would be funny to toss the NSA a lifesaver from the Titanic. The agency must have a sinking feeling right about now, as the Snowden revelations continue to ripple out into the world. *MORE ON NAMING: This article from the Washington Post claims that most of the NSA’s code names are no more than computer-generated sequences of words. If that's true, then my little exercise in finding meaning in these words is an even more quixotic venture than I thought it was. K is for klondike. My sources say Klondike is "a control system for sensitive geospatial intelligence." 'Control system' refers to a type of intelligence known as sensitive compartmented information (SCI), a type of security clearance that is even higher than Top Secret clearance. SCI is subdivided into different control systems, and access to various control systems is granted on a case by case basis. The Klondike control system protects sensitive geospatial intelligence: physical features and geographically referenced activities on the Earth, and because it's classified as SCI intelligence it's the most secret of all the secrets. Really really secret. The word Klondike also refers to the Klondike region of the Yukon in northwest Canada and Alaska where a gold rush occurred in the 1890s. 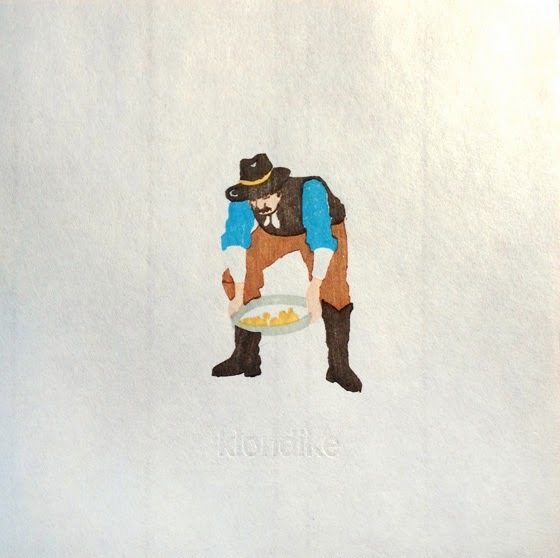 I thought that the image of a prospector panning for gold was an apt metaphor for sifting through large amounts of data looking for special nuggets. I hate that the NSA is spying on us, but as I was thinking about this image of the prospector I found myself feeling implicated in the same kinds of temptations. Really, who can blame the NSA for wanting to sift through all that juicy data? I mean, don't we all do it? Don't we all search out old friends or enemies on Facebook, or Google a prospective date or a new colleague? Are we looking at secret stuff, or just looking at what's there to look at? And don't we feel oh so powerful and smart because we have all the world's knowledge at our fingertips or in our back pocket? In a way, the NSA is just doing what we all do but on a massive — and probably illegal — scale. This week, as I was working on this print, I read an article asserting that stores are now tracking smartphone signals in malls to follow customers' movements. It's not just the government that wants to find those valuable nuggets in the river of data. Every good capitalist wants it, too.